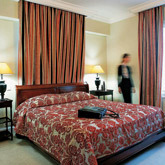 Book in advance and save up to 50% on your stay! Step into a rich tapestry of sumptuous velvet, gleaming wood, and shimmering marble under the domed atrium in the 5-star hotel Larissa Imperial. The beautifully appointed verandas and terraces overlooking the hotel’s gardensare ideal for al fresco summer living. The large garden pool provides a tranquil retreat in warmer months whilst the heated indoor spa pool and Jacuzzi are ideal for relaxation or exercise all year round. 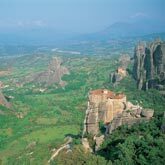 The 5-star Larissa Imperial is ideally located on the outskirts of Larissa, the vibrant capital of Thessaly in central Greece. The luxurious Larissa Imperial is favoured by business and leisure visitors being the only hotel in the town with an outdoor pool, ample car parking and extensive conference rooms with easy access. 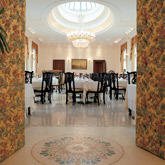 Taste traditional recipes at the Imperial Restaurant. The Lounge Bar is the ideal place for an informal get-together any time of day or enjoycool drinks, snacks and light meals from the Pool Bar. 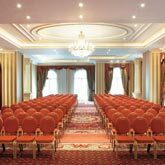 Dedicated to providing business and leisure guests with outstanding personal service, exceptional comfort and every modern convenience, the hotel has just the right spaces for conferences, business meetings or social events for up to 800 people. A major railroad hub, connecting Volos, Thessaloniki and Athens.